IO Interactive continues their support for Hitman 2 with new details on April's roadmap. Welcome to a new month full of content for HITMAN 2. We have new items, emotes and a new Location coming to Ghost Mode plus even more content, including Featured Contracts, an Elusive Target, an Escalation Contract, a Challenge Pack (with a flashy unlock!) and a game update. But enough chit chat, let’s have a closer look at what’s coming your way in April. 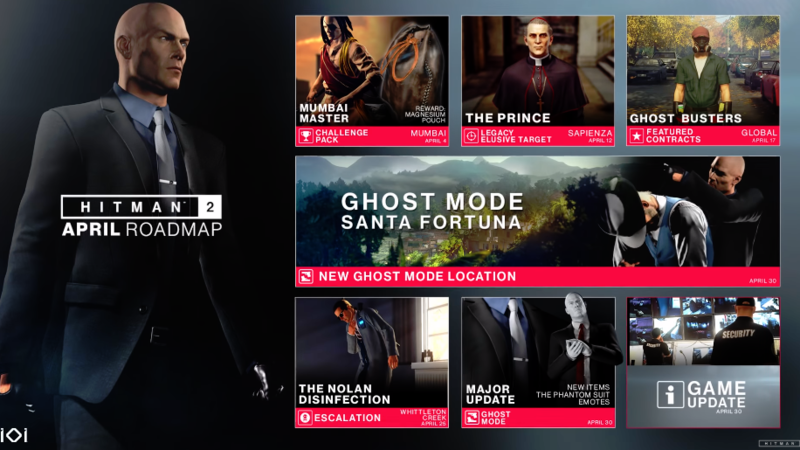 The developers have stated that Hitman 2 will get Ghost Mode will come to the forest along with the outfit manipulator. This will randomly change the outfit of you and your opponent. In addition, 3 new items have been added. The Ghost Freeze grande, flash grenade, and ghost proximity grenade for multiplayer. Other additions include challenge pack 4, The Prince as a new exclusive target on April 12th, Escalation Contract on April 25th for The Nolan Disinfection, and new featured contracts. Hitman 2 is now available for PS4, PC, and Xbox One. Check out our review here.